The Savic Aseo Jumbo Cat Litter Tray gives large cats enough room to do their busineΒ in comfort. The high rear edge of this litter box and the practical protective border ensure that everything stays inside the box, even if your cat tends to pee standing up, or throws a lot of litter around when it has finished. This helps to keep the area around the tray clean and tidy. The front side of the tray is much lower than the back, to make it easy for kittens or older cats to get in and out of the tray. The white border is easy to remove and re-attach, for easy cleaning and good litter tray hygiene. 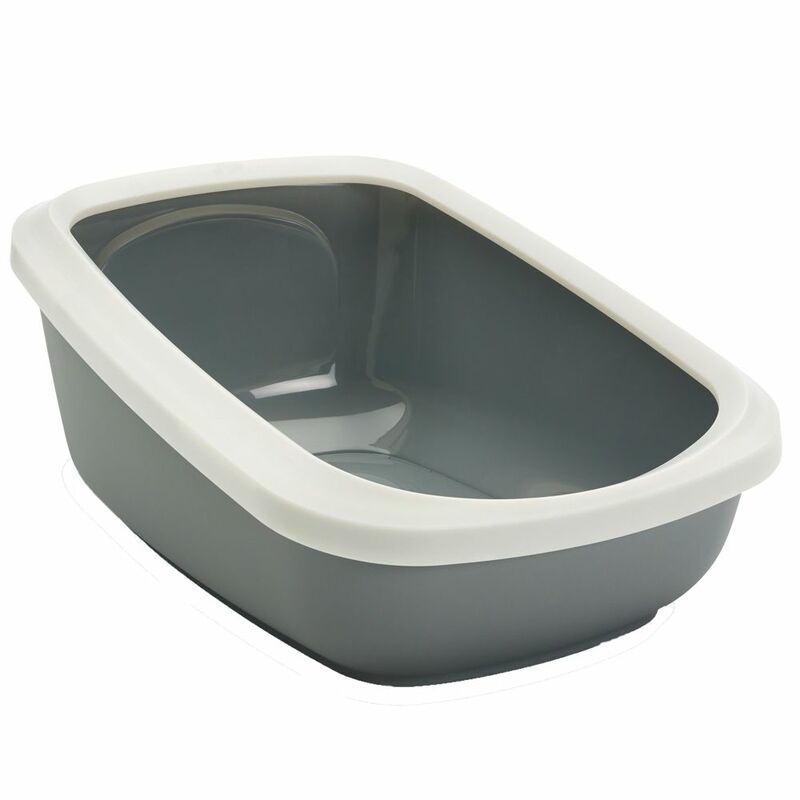 The Savic Aseo Jumbo Cat Litter Tray with High Edge at a glance: Roomy cat litter tray Ideal size for larger cat breeds, for multi-cat households, or for mother cats and kittens Extra high rear edge and a shaped protective border: to keep the litter inside the tray and the surrounding area clean and litter-free. Ideal for cats that stand to pee Lower entrance: lets cats acceΒ the litter tray easily, even if they are ill. Also suitable for older cats or kittens Removable protective border: border can be removed for easy cleaning and hygiene, and is simple to re-attach Made in Belgium Colour: light grey, dark blue or mocha with a white border Dimensions: Total (L x W x H): 67. 5 x 48.5 x 28 cm Inner dimensions approx. (L x W x H): 56 x 39 x 27.5 cm Height of entrance approx. 17.5cm (without border approx. 14cm) Height of back wall approx. 28cm (without border approx. 26.5cm) Protective border overhang approx. 3 cm Sizing for Savic Bag it Up Litter Tray Bags - Jumbo: Suitable for trays up to: 67 x 48 cm (L x W) Contents: 12 bags More information about Savic Bag it Up Litter Tray Bags can be found here: Savic Bag it Up Litter Tray Bags.